This piece of artwork called “La Mer”, was painted in July, 2018 by Djalouz, Pesca and Caligr who are three French artists. 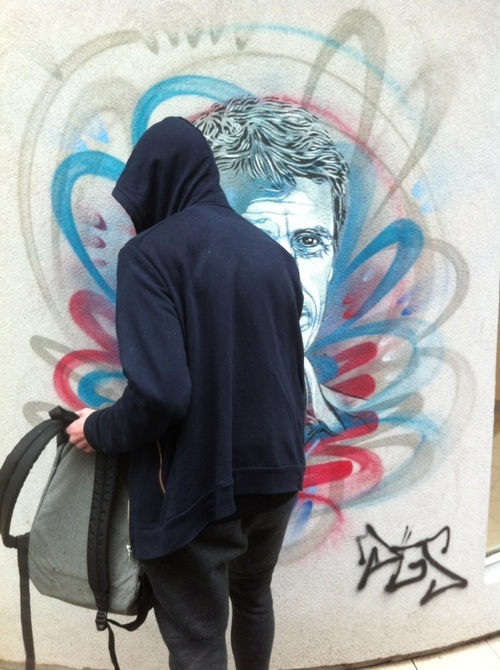 We found this graffiti on a wall in “30 rue de la Butte aux Cailles” in the 13th district of Paris. 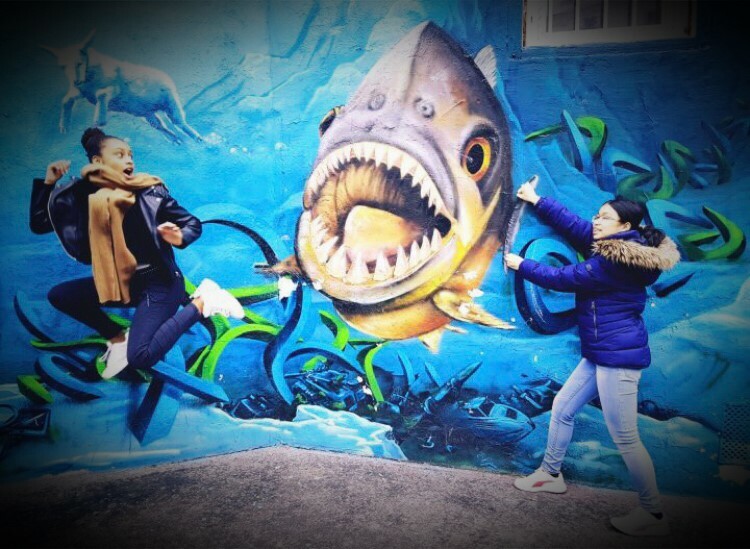 In this picture, we are chased by a giant hungry fish which is trying to devour Lena first but I (Claire) am holding the tail of the fish to help Lena escape. 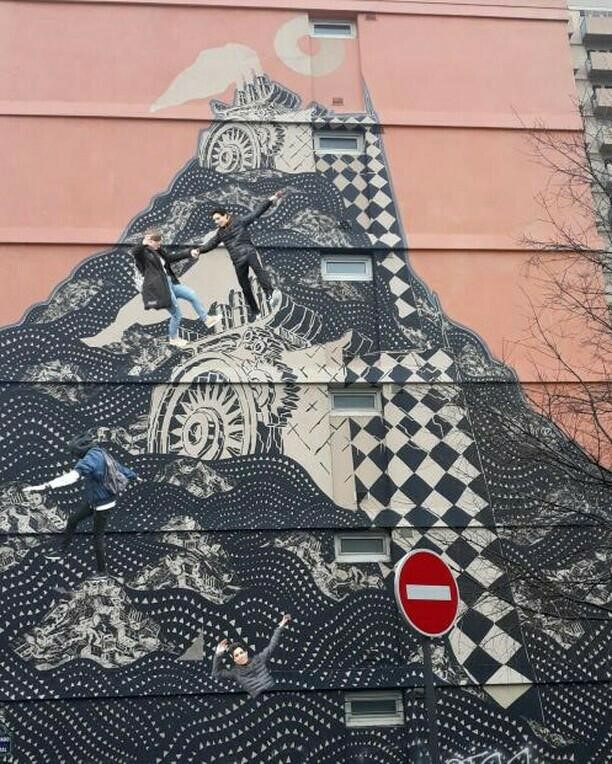 We chose this mural because we found this graffiti very inspiring and very funny, amazing and beautiful. In this picture we wanted to represent ourselves trying to escape from the rise of water. We tried to be on the photo by doing a photo collage, which was very difficult to do. On this mural, we can see the sea or the ocean destroying cities. There are two wheels that look like boats with a factory on each of them. We can also see ruins of the old cities destroyed by the water. Laurent is trying to save his life by standing on these ruins. At the bottom, Jules is drowning, and at the top Mila and Jules are on a boat trying not to fall in the water by holding their hands. The artist might want to show people that global warming will cause the rise of water and destroy everything on Earth. He could think that everything will be this way if we don’t do anything. By this piece of artwork, he could also denounce the fact that humans know that they are slowly « killing » themselves but that they do it anyway, and they save factories before humanity. We chose this picture because we thought the message we interpreted was beautiful, meaningful and powerful. Through this artwork, the artist can make people of all ages aware of global warming and the danger that it represents for them. This painting was created by Jana and JS. They are husband and wife and they have been painting together since 2006. They use stencils for their artworks based on their personal photographic works. 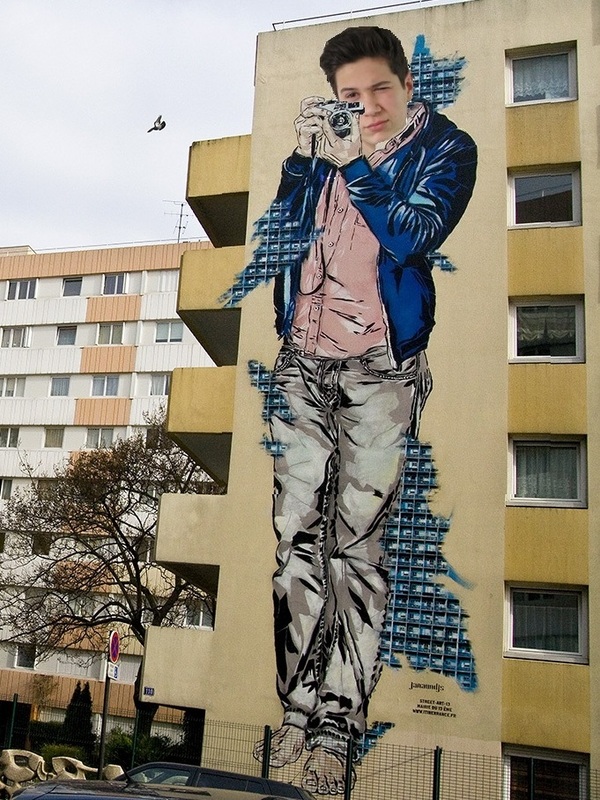 This painting is a portrait which represents a photographer who is taking a picture with his camera in front of him. He's tall and he's standing up. He has a blue jacket, a pink shirt and grey trousers, but no shoes. The photographer looks focused because his left eye is closed. I think that the artists want people to remember how important the work of photographer is, because when you are a photographer, you may take risks to inform other people. Jana and JS may also want to show that there are many things to see around us. Furthermore, as the photographer is watching us, this feeling of being photographed makes us important, and as everyone may have the same feeling, it could show that all people are equally important. Last, but not least, I appreciate this painting because the young man on the painting is really cute! 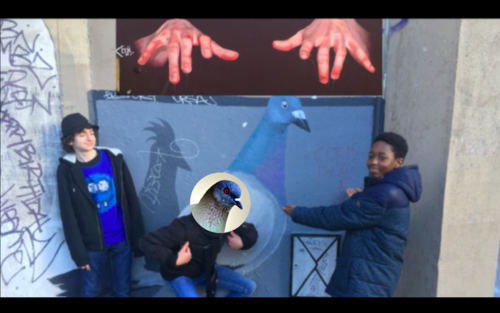 -The pigeon's shadow is a rooster which is the symbol of France so we thought that the street artist wanted to say that French people have changed and are less charismatic, sadder and dirtier like pigeons are to roosters. -The artist is unknown because he wants to express a big message to French people but he doesn't want any trouble with the law. - The pigeon catches my eyes because it's the center of the picture.